Landmark Center was built in 1902 and originally served as the Federal Court House and Post Office for the upper Midwest. Today, Landmark Center serves as a cultural center for music, dance, theater, exhibitions, public forums, and private events. Onsite attractions include Anita's Cafe, Landmarket Gift Shop, the AAW Gallery of Wood Art, the Schubert Club Museum, ongoing exhibits by the Ramsey County Historical Society, and an interactive interpretive exhibit "Uncle Sam Worked Here." 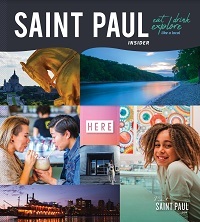 The building is also home of the Saint Paul Visitor Information Center, and offers public and private tours. Visit the Landmark Center's website to learn more.